Hunt Smart Productions, L.L.C. is dedicated to helpingthe "Do It Yourself" sportsman and sportswoman to be more successful on their self-guided hunting adventures. 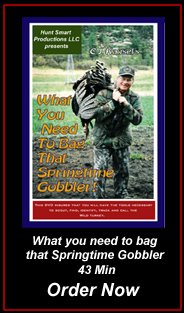 In this DVD program, "What You Need To Bag That Springtime Gobbler", CJ Kausel shares with you many years of experience scouting, tracking, calling and waiting breathlessly for this wiliest of creatures to come within range. Yelp, cluck, cut, cackle, purr and gobble. Learn the sequence to lure that gobbler toward you. Turkey hunting requires skill, stealth and extreme patience. Outwitting this bird presents numerous challenges. CJ has been there, successfully drawing his quarry to him. This DVD is a must for your library.